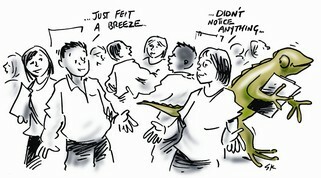 What metaphor describes your style of facilitation? Great piece, Andrew. On a good day, I’d like to be an invisible one, but if I’m honest, I’m rarely that. Somewhere between facilitator as fool and parent letting go. Thanks for sharing the great cartoons, I’ll tag them! Are you talking about f2f, online or both? Is there a difference according to you? I worked with an experienced f2f facilitator, who worked for the first time online, and it’s amazing how easy it was for him. The characters came from a survey where we invited facilitators to describe what metaphor described their style of facilitation. The facilitators who took part, worked on the whole as f2f facilitators. We have a paper which we will be releasing shortly with more info on the survey, the results and the demographics etc. Your question about whether there is a difference between online facilitation and face-to-face facilitation is a great one. 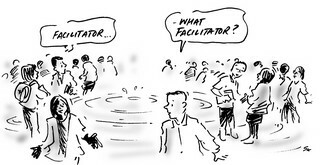 In many ways it gets down to the question of ‘what are the essential skills of facilitation’? I would say that the obvious big difference between f2f and online is the ‘body’ and ‘presence’ element involved in f2f. This to me is an enormous difference between the 2 environments. As we’ve found with our sociometry and action methods work, there is a huge difference between people raising their hand and asking a question, as opposed to bringing their body with the question within to a place of delivery. 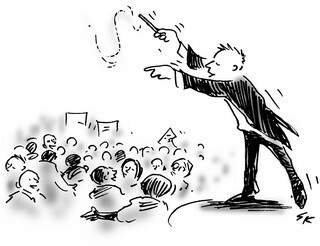 What would a facilitator who “holds the space” look like? 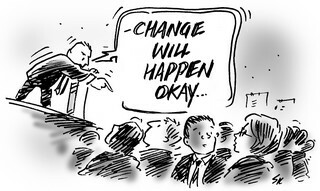 What metaphor would capture a graphic facilitator? Many of the facilitators who participated in our survey were open space facilitators. I wonder whether the theme of ‘moving with the elements’ is somehow representative of ‘holding the space’?